If you missed it yesterday, fear not! According to the Creative LIVE ON-AIR schedule, starting at 12pm ET today (Wedn 12/22/17), there will be rebroadcast of the Camera Buyer’s Guide by John Greego that premiered/recorded yesterday. Rebroadcasts typically rerun over and over until around 12pm ET of the next day, so you have multiple chances in the next 24 hours to catch it. If you want to escape the Black Friday madness productively, we have an educational alternative for you! The Creative LIVE ON-AIR schedule where you will find a variety of photography and creative classes streaming for FREE! ON-AIR free-streaming classes start at 12pm ET, and among today’s classes is the world premiere (recording LIVE) of a brand new class, Camera Buyer’s Guide by John Greego! ON-AIR free-streaming classes start at 12pm ET, and among today’s classes is the “Fine Art Landscape and Travel Photography” by Peter Eastway and Tony Hewitt. If you want a sneak peek, go under “Class Materials” and there you will find the Transcripts of all 48 lessons. Meanwhile on Tuesday 11/21/17 at 12pm ET there will be the world premiere (recording LIVE) of a brand new class, Camera Buyer’s Guide by John Greego! If you enjoy nature photography and videography, the new condition Planet Earth II 4K BluRay + 4K standard edition is on sale for $30 with free shipping at Amazon by Amazon itself with up to two sets per customer. I am trying to have a mix of all kinds of deals since it’s raining from all directions, so now time for some learnings! Ending Sunday night, CreativeLIVE has a 15 Classes for $15 each sale which includes “Lightroom 101” with Jared Platt, the “Inside the Home Studio” class, Senior (school, not age) Portraits, lighting, and more. No coupon is needed, the sale price is reflected on their website while this promotion is running. This is a sale on existing classes, they are not airing for free promotionally. Wednesday is here and according to the CreativeLIVE On-AIR Schedule, today we have the world premiere (recording LIVE today) of another brand new photography class by Tamara Lackey, Capturing Authentic Children Portraits. This records in front of a live studio audience in Seattle. As usual, the class starts at 12pm ET today (Wednesday 11/8/17) and it is free to watch during this promotional FREE-to-Watch window. If you like it well enough to want to watch again, they have a pre-order sale for $55. Also starting at 12pm ET today, it is a FREE to watch rerun of Ben Willmore’s Adobe Photoshop 101. This consists of 48 lessons. If you can’t wait for the free-to-watch stream to begin, locate the “Class Materials” sub-tab, and page down. Lesson #6 (Contrast and Color) is FREE to download in SD or HD (no login or sign-up needed to download it). And if you are on the Nikon D850 Hype Train, SAVE THE DATE! December 6 is when CreativeLIVE will have the live recording (world premiere) of their Nikon D850 Fast Start class with John Greego. Fear not, I will post more reminders as we get close to that. The pre-order price for the class is $39. According to the CreativeLIVE On-AIR Schedule, today we have the world premiere (recording LIVE today) of a brand new photography class by Tamara Lackey, Building Your Family Portrait Business starting at 12pm ET today (Monday 11/6/17). You can watch for FREE during this promotional window until Tuesday PM [it will probably rerun through the night, it’s not a 24×7 live class]. “LIVE”, as designated with a yellow tag in the On-AIR Schedule listings indicates that a class is recorded LIVE, it is the world premiere. Classes without the LIVE indicator are rebroadcasts/reruns but still free to watch during the dates shown in the On-Air schedule. 12pm eastern (9am pacific) is the start of a new streaming day at Creative LIVE and according to their On-AIR Schedule, continuing today is a FREE to watch repeat of the Photo Week 2017 which has two parallel channels of online classes. These repeat throughout the night. This will continue until November 6 (Monday). According to the latest On-AIR Schedule at CreativeLIVE, starting at 12pm eastern on Saturday, they will have a FREE to Watch re-airing of the Ben Willmore class Adobe Lightroom CC Photo Editing: The Complete Guide. The class will be free to watch during this promotional re-airing. If you like it well enough to want to watch it later again and again, you can purchase it for $149 during this promotional window. But that’s not all. You can also download for FREE the first lesson. 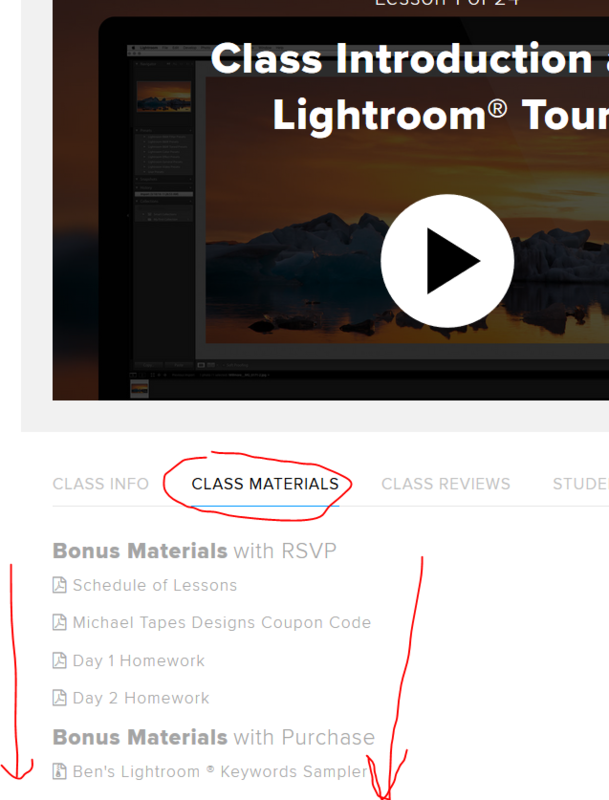 Click on the “Class Materials” sub-tab and then page further down and down until you get to the “Video Downloads” section. You will find the first lesson (56 minutes long) available for download as an SD (95MB) or HD video (354MB). But if you are not interested in Lightroom, fear not! Continuing today is a FREE to watch repeat of the Photo Week 2017 which has two parallel channels of online classes. These repeat throughout the night. This will continue until November 6 (Monday). Per the On-AIR Schedule at Creative LIVE, FREE to watch, re-running today, until 12pm ET on Friday will be the Nikon D7500 Fast Start Class with John Greego. Since this is a re-run, it will repeat throughout the night until its expiration Friday AM. Continuing until November 6 is a free to watch repeat of the Photo Week 2017 which has two parallel channels of online classes. These repeat throughout the night. Separately from the previously mentioned Free to Watch online classes, CreativeLIVE has a sale with a discount of up to 40% off (percentage varies by class) on their various Adobe-related classes covering Lightroom, Photoshop, CC, Premiere, along with related Tools and Techniques (retouching, layers, blend modes, etc). The Photo Week 2017 collection of 40 classes, five keynotes and five critique sessions is now re-airing FREE to watch at Creative LIVE until November 6 in 2017. Since this is a rebroadcast, it will loop through throughout the day. A new day should begin at 12pm ET every day. If you like what you see, they have a promotional bundle for $200 that gets you all 40 classes, five critiques and five keynotes. For all the classes currently airing for FREE, and planned to air for FREE in the next few days, check their ON-AIR Schedule. We have another “world premiere”, a new class recording LIVE today, starting at 12pm eastern (Tuesday 10/31/17), you can watch LIVE and for FREE, with John Greengo, it is the Nikon D7500 Fast Start class. This is the latest Nikon APS-C model, and it is in-stock and shipping [see Stock Status Tracker]. But that’s not all! If you missed yesterday’s Canon EOS 6D Mark II Fast Start class, it will be re-running today for FREE starting at 12pm ET. You can find future classes scheduled to stream for FREE at the Creative LIVE On-Air Schedule. Classes with that yellow LIVE tag means they are recording for the first time on that date, a world premiere. Classes without that tag means they are rebroadcasts. The classes you see on that schedule are free to watch on the days they are listed under. Good until tonight (Tuesday 10/31/17), Udemy has a $12 online class sale which includes a number of photography classes. There is no coupon code to enter, the sale is factored into their website. Use the search box over there to search for topics of interest, eg “photography” or “lightroom” or anything else you are interested in. Each class’s individual listing has a box below the price that lists the length of the class along with the terms and access. Udemy classes can be viewed with a desktop web browser, a mobile web browser, iOS and Google Play apps, along with Apple TV (only watch/listen; the other features don’t work on Apple TV). If you are not familiar with them, you can get a feel of the website, the apps and how the courses work by getting some of the free courses. This includes an 8-hour “Learn Photoshop from Scratch” class by Eduonix Learning Solutions available for FREE. Also FREE is a 4.5-hour “Photoshop In-Depth: Master all of Photoshop’s Tools Easily” online class by Chad Neuman, Ph.D. Starting at 12pm eastern today (Monday 10/30/17), you can watch LIVE and for FREE the world premiere (it is recording LIVE) of the John Greengo Canon EOS 6D Mark II Fast Start class. You can watch it for free while it is recording. If you want to watch it in future dates, you can purchase it for a pre-order special of $34 or wait for a future free re-airing. If you missed the world premiere of this class on Wednesday, fear not! Creative LIVE is re-running this class online and for FREE until Saturday 11:50am ET. This calls being Jared Platt’s Lightroom CC for Professional Photographers. It consists of 14 video lessons, the transcript of some of them is available under the “Class Materials” sub-tab. During this promotional window, if you like this class well enough to want to watch it in the future, you can purchase it for a one-time $39 price. This is a heads up so you can plan ahead if interested! Per the Creative LIVE On-Air Schedule, on Wednesday 10/25/17, running from 12pm ET to 7pm ET you can watch LIVE and for FREE the world premiere (and recording) of a new class by Jared Platt, Lightroom CC for the Professional Photographer. You can watch this class for FREE while it is recording live. If you like the class and want to watch it again, you can purchase it for $39 as a pre-order special. It is Day #4! Running this week, October 9-13 (Monday through Friday) in 2017, Creative LIVE is having their Photo Week 2017. 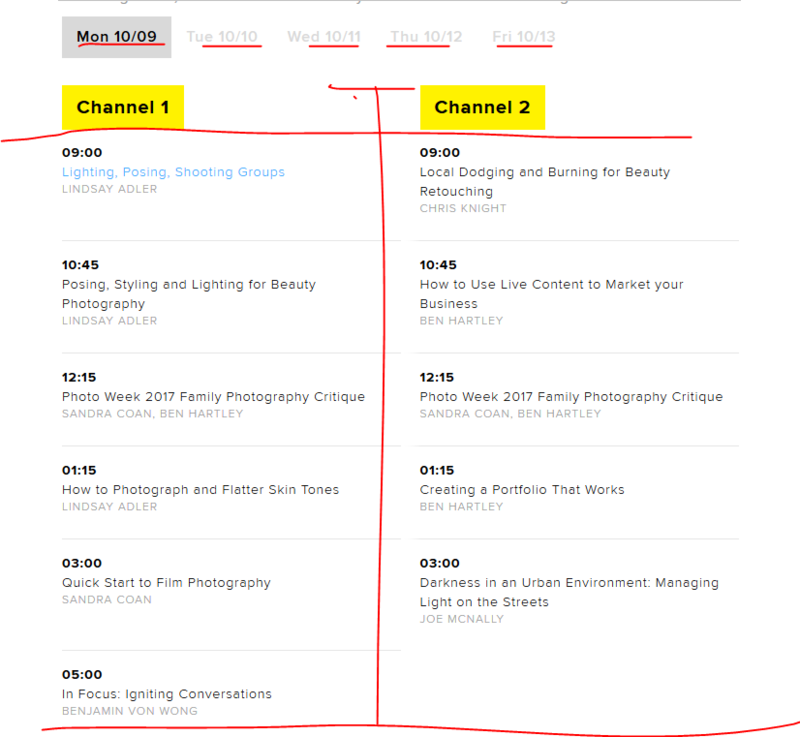 There are five days of FREE live-streaming classes, with TWO parallel channels running per day (think of it as ESPN and ESPN2). There is a variety of content planned: 40 classes, five keynotes, and five photo critiques. Running this week, October 9-13 (Monday through Friday) in 2017, Creative LIVE is having their Photo Week 2017. There are five days of FREE live-streaming classes, with TWO parallel channels running per day (think of it as ESPN and ESPN2). There is a variety of content planned: 40 classes, five keynotes, and five photo critiques. This is a heads up. I will post more reminders as we get closer, but in case you want to plan ahead for this, next week, October 9-13 (Monday through Friday) in 2017, Creative LIVE will be having their Photo Week 2017. There are five days of FREE live-streaming classes, with TWO parallel channels running per day (think of it as ESPN and ESPN2). There is a variety of content planned: 40 classes, five keynotes, and five photo critiques. Starting at 12pm ET on Thursday and running for about 24 hours after that, you can watch online for FREE the Fuji X-T20 Fast Start Class by John Greego at CREATIVE LIVE. The class is made of 20 video lessons, which you can see under “Class Materials”. During the FREE-to-Watch promotional period, you can watch it as much as you want. 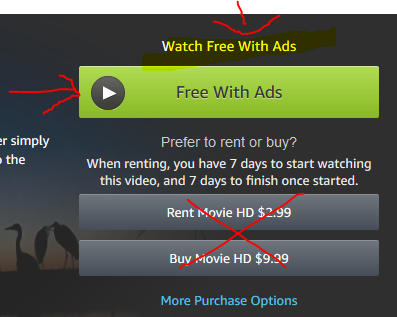 Once the promotional free-viewing period ends, if you want to watch it again, you have to either purchase it or wait for a possible future re-airing. You can see the current and upcoming schedule of FREE-to-Watch classes at their ON-AIR Schedule page. FREE to Watch (not to own) for a limited time, among the latest CreativeLive FREE to Watch Online Classes is an introduction to using Multiple Flashes by Mike Hagen. An artful science some could argue. Judging by the schedule over there, the class will repeat until 9am pacific on Friday 9/15/17. The class consists of 27 video lessons. It is free to watch during this promotional period. If you want to it after that, you have to either purchase it (on sale for $39 during this promotion), or wait if/until it runs for free again as part of another re-airing promotion. Good until Sunday night, CreativeLIVE has a flash sale on 12 Online Classes for $29 including “Food Photography”, “The Art of Seeing”, portraiture, and more. They also have a free 1.5 hour class by Ben Willmore, Photoshop Hall of Famer, on Beginner Photoshop Troubleshooting. For more current and future free-streaming classes at Creative Live, check their On-Air Schedule. You can use the Subject/Topic based sub-listings. The default on the page is “All Classes”. The “Photo & Video” filter is right next to it. There’s a variety of topics coming up, but no camera “fast start” guides scheduled at the moment. Running until Thursday night 8/31/17, FREE to Watch online, is the Adobe Photoshop CC for Beginners online streaming classes by Dave Cross at CreativeLIVE. During this promotional period, you can watch it for FREE as it streams. After the promotional streaming period ends, you have to buy it in order to watch it, or wait for a possible rerun in the future. For more current and future free-streaming classes at Creative Live, check their On-Air Schedule. You can use the Subject/Topic based sub-listings. The default on the page is “All Classes”. The “Photo & Video” filter is right next to it. Nikon D850 Learnings Part II! Starting at 6pm ET today, there will a brand new live video-streaming six-person panel talking about the Nikon D850 and its capabilities. The panel will have both still and video experts, including the one and only Joe McNally. You can watch it at Adorama and B&H Photo. The stream is using Livestream technology which may require Adobe Flash. For pre-ordering options, check the Stock Tracker. If you are curious about the Nikon D850, starting at 1pm ET today (Monday 8/28/17), B&H Photo will have a Nikon D850 Live Stream with a panel discussing the camera live on video. A second separate live stream is planned for Tuesday at 6pm ET with a panel of six, including Joe McNally. The video-streaming is using Livestream. NOTE: the video stream may require Adobe Flash. The D850 is available for pre-ordering ~ check Stock Tracker for options. The Nikon D850 is now a real product, available for pre-order for $3300, and it has already been added to the Stock Status Tracker. If you want to learn more about it, and ask specific questions that you want answered from people in the know, B&H is planning not one but TWO LIVE PANEL Discussions on this very camera! On Monday 8/28/17 at 1pm Eastern (10am Pacific), a panel of four, including two Nikon Ambassadors will be talking about the camera. On Tuesday 8/29/17 at 6pm Eastern (3pm pacific), a panel of six, including the one and only Joe McNally, will be having a hands-on with the D850 live, with both stills and video experts in the panel. If you have any questions you want the panel to answer or want to follow the online discussion about it, check the #BHPhotoLive Twitter hashtag. Tweeting a question also enters you into a drawing to win a Nikon D850! Streaming will happen using LiveStream technology (not YouTube), so if you have a mobile device that can’t handle Livestream, make sure you are near a device that can handle it. Starting at 4pm Eastern today (Friday 8/11/17) at CreativeLIVE, another John Greengo FAST START online class will be streaming for FREE, this one focusing on the Fuji X-T20. You may need a Flash enabled browser if you are not seeing video on a browser without or if you have turned off video-playback and such in your browser. Creative LIVE has a limited time sale, featuring Select Photography Classes for a limited time for $29 each. But if you prefer not to pay, and you have schedule flexibility, you can watch classes for FREE when they are originally recording online. Check their ON-AIR SCHEDULE for the upcoming schedule. They have a variety of classes. If you have a Canon 77D APS-C DSLR, or you are curious about it, starting at 12pm Eastern today (Saturday 7/28/17), the CreativeLIVE Canon 77D Fast Start online class with John Greengo will be streaming LIVE and for FREE until 11:50am ET on Sunday. This means the class will repeat during the day. A total of 27 lessons are part of it, you can see them under the “Class Materials” tab over there. During this promotional period, you can watch the class for FREE. If you want to watch it later, you have to purchase it or hope for a future rerun. If you like it, they have it on sale while the free-streaming promotion is running. For buyers, the class is also available for download (mp4 files in HD or lower resolution for mobile/cellular). If you have a Canon D-Rebel T7i DSLR, or you are curious about it, starting at 12pm Eastern today (Friday 7/28/17), the CreativeLIVE Canon D-Rebel T7i Fast Start online class with John Greengo will be streaming LIVE and for FREE until 11:50am ET on Saturday. This means the class will repeat during the day. A total of 27 lessons are part of it, you can see them under the “Class Materials” tab over there. If you have a Nikon D5600 or you are curious about it , starting at 12pm Eastern today (Thursday 7/27/17), the CreativeLIVE Nikon D5600 Fast Start online class with John Greengo will be streaming LIVE and for FREE until 11:50am ET on Friday. This means the class will repeat during the day. A total of 22 lessons are part of it, you can see them under the “Class Materials” tab over there. Stacksocial launched a new limited time coupon, coupon code SANTA90 (yes, we are five months away from Christmas 2017), gets you 90% off online courses offered at their website which include their Adobe Lightroom CC Photo Editing Masterclass dropping from $95 to $9.50. There are 55 lessons in this class produced by VideoSchoolOnline, with 6 hours of content, 15-day satisfaction guarantee, and lifetime access. Check the aforelinked product page for all the details. The Course Outline is available further down the page over there. If you have a Sony a6500 or you are Sony a6500 curious, starting at 12pm Eastern today (Tuesday 7/25/17), the CreativeLIVE Sony a6500 Fast Start online class with John Greengo will be streaming LIVE and for FREE until 11:50am ET on Wednesday. This means the class will repeat during the day. A total of 24 lessons are part of it, you can see them under the “Class Materials” tab over there. During this promotional period, you can watch the class for FREE. If you want to watch it later, you have to purchase it or hope for a future rerun. If you like it, they have it on sale while the free-streaming promotion is running. For buyers, the class is also available for download (mp4 files in HD or lower resolution for mobile/cellular). Lesson #1 is available as a free download if you want to test how it works/looks on your PC, tablet or phone. If you have an Olympus E-M1 II or you are E-M1 II curious, starting at 12pm Eastern today (Monday 7/24/17), the CreativeLIVE Olympus OM-D E-M1 Mark II Fast Start online class with John Greengo will be streaming LIVE and for FREE until 11:50am ET on Tuesday. This means the class will repeat during the day. A total of 32 lessons are part of it, you can see them under the “Class Materials” tab over there. During this promotional period, you can watch the class for FREE. If you want to watch it later, you have to purchase it or hope for a future rerun. If you like it, they have it on sale for $36 while the free-streaming promotion is running. For buyers, the class is also available for download (mp4 files in HD or lower resolution for mobile/cellular). Lesson #1 is available as a free download if you want to test how it works/looks on your PC, tablet or phone. CreativeLIVE is back with another photography class sale. A number of classes in a variety of topics are on sale for $19 each for a limited time only. CreativeLIVE is back with another sale, this time they offer a dozen online classes for $19 each. It is a diverse set, from building DIY Lighting Gear, to authentic portraits, to being a second shooter, and more. Online classes too are jumping on the Prime Day hype train. CreativeLIVE is having a Mid-Year up to 50% off Sale on their classes. The price you see over there, is the price you pay. No coupon code needed. But if you prefer not to pay, and you have schedule flexibility, you can watch classes for FREE when they are originally recorded online. Check their ON-AIR SCHEDULE for the upcoming schedule. There’s a variety of classes, including camera-centric courses (eg T6, 80D, 77D, D-Rebel T7i), and photography and post-processing and more.